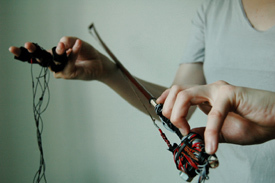 A violin bow stringed with copper chords produces tones when bowed on the skin. Being a conductor by nature, it becomes the surface for the creation of sounds, an electro-dermal interface. 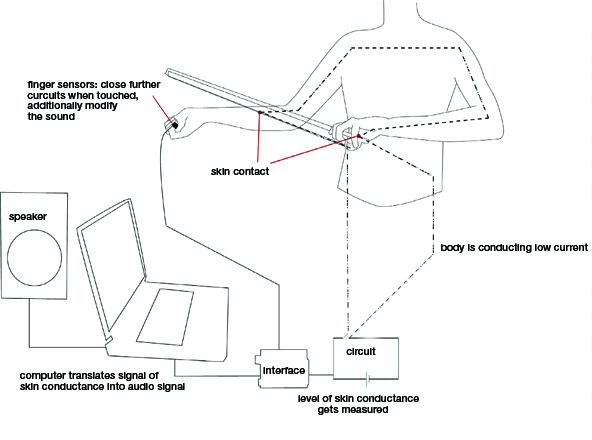 The human skin is the most sensitive part of this instrument. Due to its conductance reactions, there is a natural limit to regulating the modulation of sounds. body and ultimately an interaction with oneself. When the copper strings come into contact with the skin a circuit is closed which in turn generates sound. The small changes of the skin's conductibility - caused by reactions to outer as well as inner stimuli - are what modifies the emerging sounds in pitch and volume.